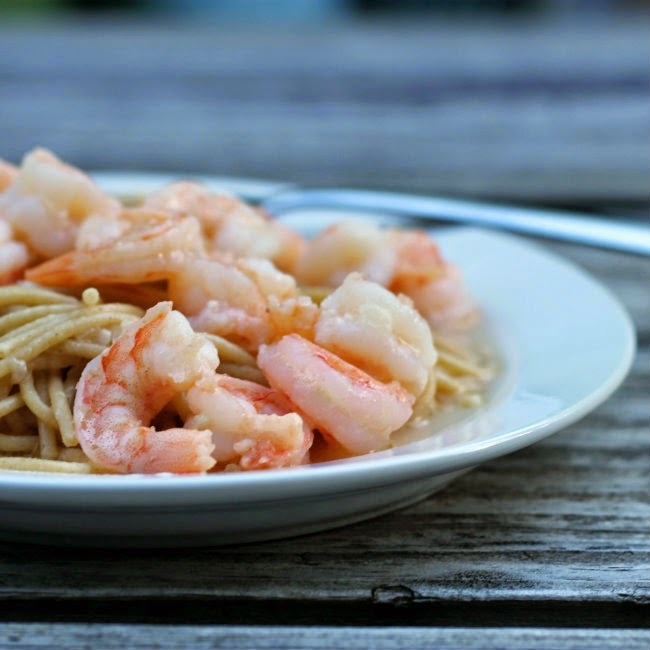 A simple shrimp scampi, because sometimes simple is just better! As I mentioned in my last post my father-in-law is visiting us from Florida for the next two weeks. I could not have asked for a better father-in-law… he is a super guy and I love him to pieces. The nights are filled with card playing, laughter, and just plain fun. I am working during the days and believe me it is hard to leave in the morning knowing that Mike and his dad will be having fun during the day. But we have been having some great dinners when I get home from work. My father-in- law is one of those people that I love to cook for, no matter what it is he tells me he loves it. So I love to cook meals that I know or at least think are his favorites. 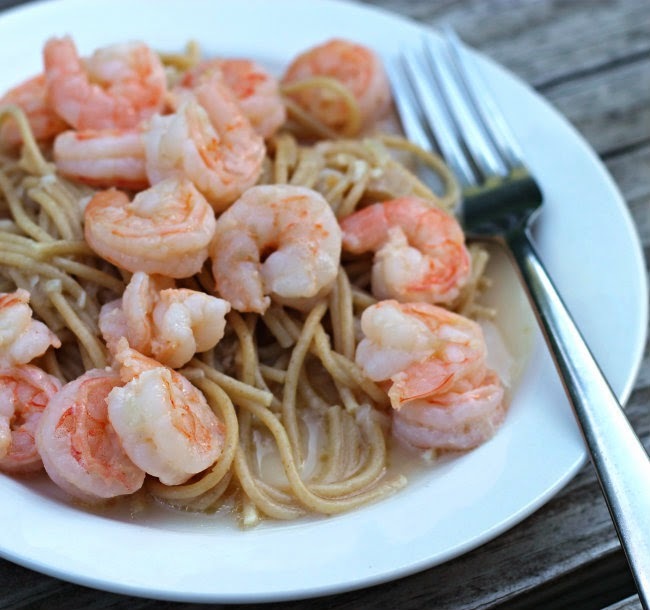 Shrimp scampi is one of those meals that are on the list. This one is a simple one that I like to serve over noodles with some slices of French bread that have been toasted just a bit in the oven. 1. In a large kettle cook pasta according to the direction on the box. 2. In a large skillet melt the butter over medium heat. Once the butter is melted add the garlic and onion. Saute for a couple of minutes or until the onion is tender. 3. Add the shrimp and cook until they turn pink. Time will vary depending on the size of the shrimp. 4. Once the shrimp is just about done add the wine and lemon juice. Bring this to a boil and take of heat. 5. Serve over your favorite pasta along with some nice crusty bread. I love shrimp this look so good! Love simple delicious comfort meals like this! YUM! This is sure simple and easy…great for a weekday meal. That shrimp looks amazing. 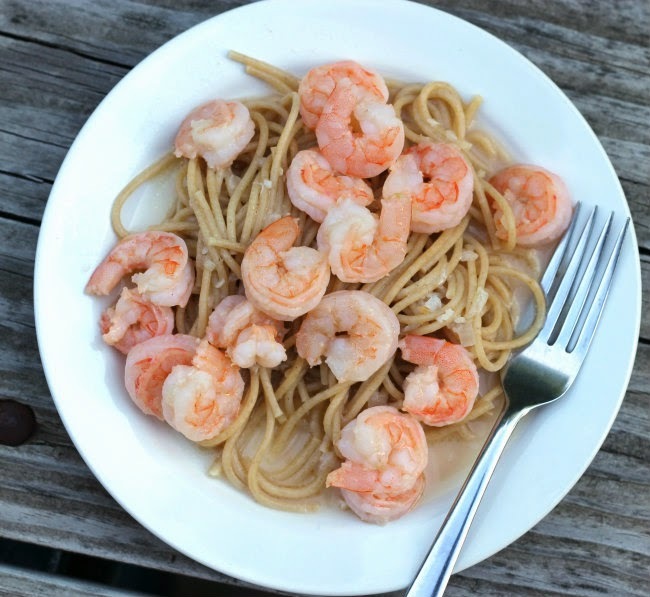 I have to admit that I love to plan shrimp dishes when I’ve had a busy day, they’re quick and easy to make and so flavorful.